Our Solar Window Tinting Films provide green energy by reducing operating costs through a sustainable glass upgrade. Our Window tint lowers energy costs by reducing the shading coefficient,UValue,emissivity and solar heat gain coefficient of your building's glazing. 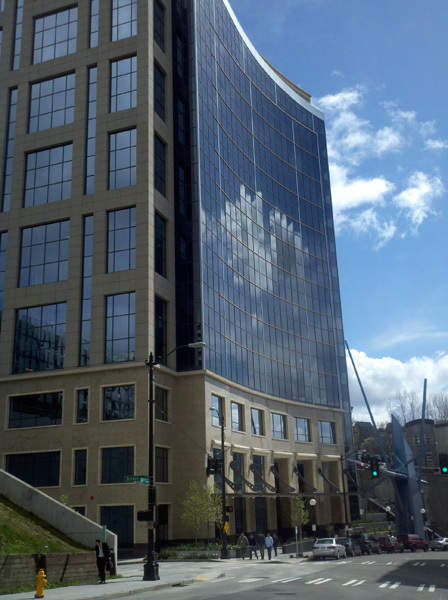 Improving your building envelope performance, energy management and energy conservation can all be attained through the application of Sun Control Energy Saver Window Films. Additional benefits are providing employee comfort resulting in increased productivity, provide sun protection and add a design element to any space. Our Solar Window Tinting Films dramatically reduce the damage caused by the sun, by eliminating up to 99.9% of harmful UV rays. With our glass tinting films, you can protect your Puget Sound view home and business interiors and still enjoy the natural sunlight and views that make your home and office a more comfortable place to be. The latest in Window film technology provides a near invisible Window film, an outstanding sun control solution for the Pacific N.W. where sunlight is our friend! ABC Sun Control window films come with limited and lifetime warranties and the application of the film maintains existing window warranties. When combined with computer cutting technology, frosted films can be quickly and simply cut to reproduce complex designs and logos or even straightforward lettering either individually or for mass production. 3M’s frosted films are suitable for internal and external applications to glass, acrylic, and polycarbonate surfaces. 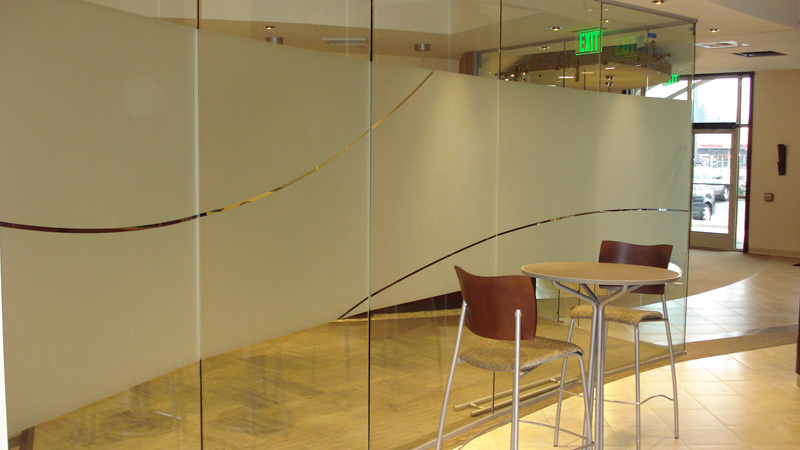 Frosted films provide a fast, efficient and economical alternative to traditional glass etching or sandblasting. Additionally we offer Digital UV graphic print for for an added design element for your projects. Fasara films, made of thin, durable polyester with a decorative matte surface, are perfect for privacy, decorative and architectural applications. Intended for use on interior glass and the inside surface of exterior windows, Fasara films can easily be used to create a custom solution for any corporate, retail or residential environment. Decorative Window Films are the perfect application for Conference Rooms, Lobbies, Retail Environments, Residential Settings, Private Offices, Glass Partitions, and wherever there is a need for Decorative Privacy.Our Decorative Window Films are available in multitudes of different patterns and shades and are easily removed and replaced to update the appearance at a later time. Now any flat glass surface can be turned into a work of art, be it an office, restaurant, den, bathroom or child's room. SOLYX ® Films diffuse light without appreciably cutting down the ambient light. As a result, any existing window can be converted to privacy glass in a multitude of attractive patterns. To help reduce your chances of loss and add to your peace of mind, ABC Sun Control has a new dimension of safety and security window films. The unique technology combines multiple, microthin layers of film to create a stronger, more impenetrable safety and security film for unmatched levels of performance. These new safety and security films create a tough, durable, tear and penetrationresistant shield that bonds to the inside of your windows for protection. The film holds the glass together to dramatically reduce the chance of glass shards from falling or flying out even under direct forces from winds or impacts from flying objects or heavy devices used for breaking and entering. Additionally the application of our safety film can upgrade annealed glass to meet ansi 97.1 safety standard, annealed glass to tempered glass. offer performance and protection benefits, privacy day & night, Outstanding glare control, combined with the opportunity to conserve on energy costs all while preserving a view of the outside.